Biomarkers are becoming an integral part of medicine. The process of biomarker discovery, clinical validation, and the adoption of biomarkers in clinical routine all pose new challenges in the fields of bioinformatics and biostatistics. With the growing availability of high-throughput technology, the medical research challenge is to discover individual biomarkers or biomarker signatures that predict therapy or therapy outcome. 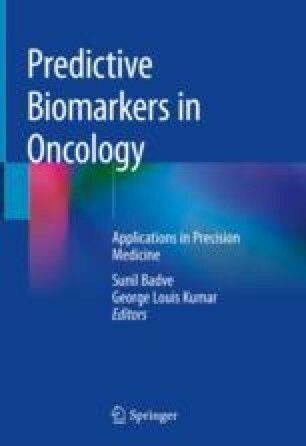 This chapter aims to give a brief overview of the bioinformatic and biostatistical methods and tools which are being used in the research of biomarker discovery, as well as the testing of biomarkers in clinical trials, up to the processing and reporting issues when applying biomarkers in clinical routine. Topics that will be discussed are (a) an overview of resources that can be used for biomarker discovery and testing, (b) bioinformatic and machine learning methods needed for biomarker discovery from omics data, (c) clinical trials and validation strategies to bring biomarkers into clinical practice, and (d) reporting and interpreting biomarkers in clinical routine.